For 28 Sherwood High School seniors swathed in green scrubs, class was a little different last week. Instead of furiously scribbling notes in the confines of their desks, students hovered over a fake patient, using a surgical robot to fix various ailments of the throat, heart and other organs. In the operating room at Legacy Meridian Park Medical Center, students played a real-life version of the classic board game "Operation." The visit was part of the hospital's partnership with local school districts in which medically inclined students perform mock virtual and orthopedic surgeries using robots. It's the first year the hospital has offered Robot Academy, said Legacy spokeswoman Alisa Cour. Kari Turner, who teaches the health occupations class at Sherwood, was happy her kids were the guinea pigs. The class is for seniors interested in a career in the health fields, anything from nursing to surgery. In the second semester, the class focuses on shadowing professionals and real-life learning opportunities such as Robot Academy. "They all said, 'This is the coolest thing we've ever done!'" Turner said afterward. "And they'd even seen a lung surgery a couple of weeks before." In the O.R., students formed a hushed clump around one of their peers attempting to drag a frog out of the fake patient's throat using the da Vinci robotic pincers. Their eyes followed Natalie Thomas' movements on a television screen above the surgical table as she successfully extracted it. "That was pretty awesome," she said. "You can maneuver the robot like your own hands." 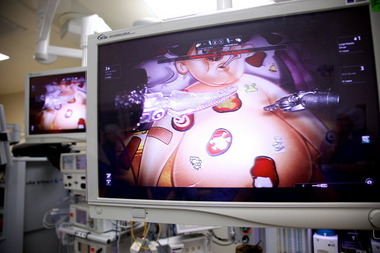 The surgeon using the da Vinci robot sits at a console with a screen next to the patient. He manipulates the robotic arms from the console and uses the screen to zoom in on what's happening in the patient. Although doctors still use laparoscopic surgery -- minimally invasive procedures done via a needle -- the da Vinci robot allows for greater mobility, said Jodie Saldanha, a nurse at Legacy. Students tried their hand at laparoscopic surgery, as well, for comparison. Doctors use the da Vinci robot to perform gynecological, urological, orthopedic and other surgeries. It is less invasive that open surgery and allows for faster recovery time. Saldanha said a patient who had open gallbladder surgery could be in the hospital up to five days. With robotic surgery, recovery time for the same surgery might be a day or less. 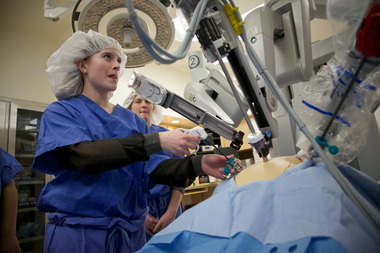 In another room, students practiced with the MAKOplasty robot, which is used for orthopedic surgeries. The kids worked with mock knees to practice replacing a portion of the knee with an implant. To do so, the MAKOplasty robot guided their movements based on a computer shot of the knee. The robot controls where the surgeon's hand goes for precision. It's one of two MAKO robots in Oregon, and Meridian Park was the first hospital in the state to perform MAKOplasty in 2010, Cour said. The three hours the students spent at the Robot Academy count toward class time and graduation. But more importantly, the hands-on experience will help them plot a career path in the medical world, Turner said. Legacy plans to expand the partnership to Tigard-Tualatin, West Linn-Wilsonville and Canby school districts. Turner was glad her kids were first. "I think we were all blown away," she said. "Legacy did such an awesome job, and I hope we can go back."